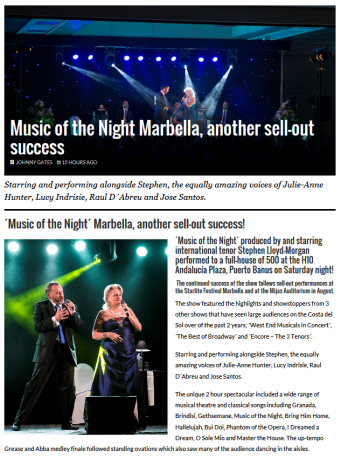 ´Music of the Night´ Marbella; another sell-out success! | Marbella Marbella – Adelante! 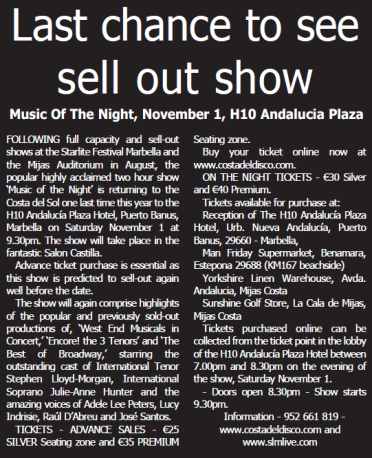 ´Music of the Night´ produced by and starring international tenor Stephen Lloyd-Morgan performed to a full-house of 500 at the H10 Andalucía Plaza, Puerto Banus on Saturday night! 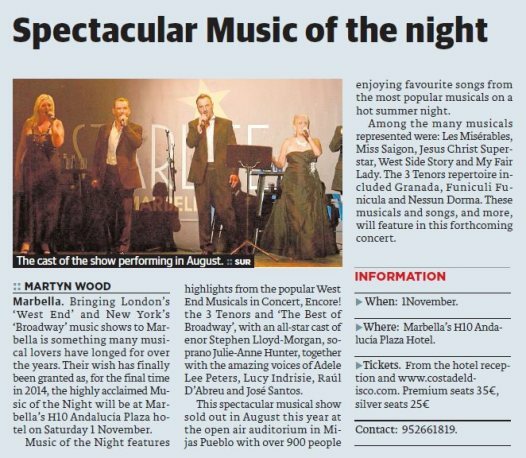 The continued success of the show follows sell-out performances at the Starlite Festival Marbella and at the Mijas Auditorium in August. 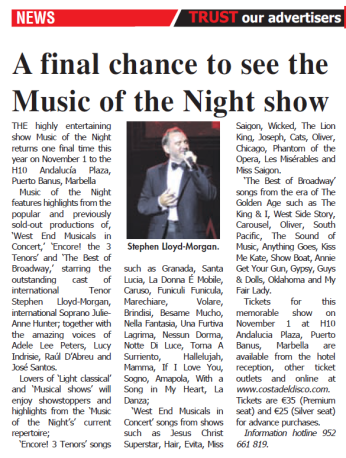 The show featured the highlights and showstoppers from 3 other shows that have seen large audiences on the Costa del Sol over of the past 2 years; ´West End Musicals in Concert´, ´The Best of Broadway´ and ´Encore – The 3 Tenors´. Starring and performing alongside Stephen, the equally amazing voices of Julie-Anne Hunter, Lucy Indrisie, Raul D´Abreu and Jose Santos. The unique 2 hour spectacular included a wide range of musical theatre and classical songs including Granada, Brindisi, Gethsemane, Music of the Night, Bring Him Home, Hallelujah, Bui Doi, Phantom of the Opera, I Dreamed a Dream, O Sole Mio and Master the House. The up-tempo Grease and Abba medley finale followed standing ovations which also saw many of the audience dancing in the aisles.